Independent Productions. 1982. Director: Peter Maxwell. Music: John Sangster. LP	(ST)	Rain Forest. RFLP-006. 1982. Not released theatrically. Produced by John Sangster and Martin Benge. Featuring Don Burrows concert and alto flutes, clarinet and fife with the following orchestra: Errol Buddle: oboe, piccolo and alto saxophone. Col Loughnan: flute and tenor saxophone. Roy Ainsworth: bass-clarinet and baritone saxophone. George Golla: electric and acoustic guitars. Tony Ansell: electric piano and synthesiser. Chris Qua: Bass. Alan Turnbull: Drums and finger-cymbals. John Sangster plays the percussions, which include marimba, vibraphone, bell-tree, glockenspiel, vibraslap and tambourine. All compositions copyright John Sangster Music (JSM). and the clarinet. It is, after all, music for Fluteman. A stereo-mix of the soundtrack music. leaving the little deaf boy, Toby searching for them. A variation for the alto-flute and the guitar. A jazzy variation, with solos for Don’s concert flute. First, A Little Smile. (7:23). Into the streets the Piper stept. Smiling first a little smile, As if he knew what magic slept In his quiet pipe the while. A version for clarinet, bass-clarinet, marimba and guitar. With the drums and bass and some piano sounds. 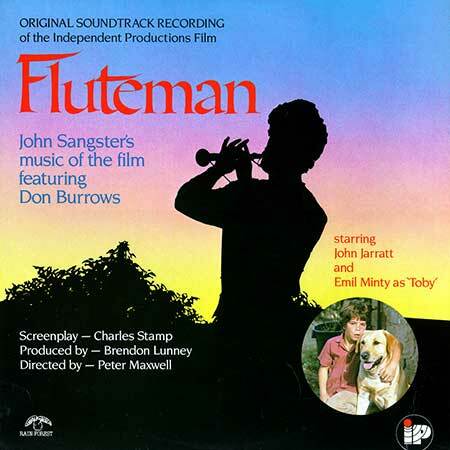 Fluteman’s music brings the rain to a drought-stricken town, and everybody celebrates. This is another stereo-mix of the soundtrack music, which is why you hear the baddies, thoroughly discomfited, scurrying away at the end of the piece. ...And Pay The Piper. (4:15). Some vibraphone variations on Fluteman’s theme. Featuring Don’s fife, or, as he prefers to call it, the school-flute.